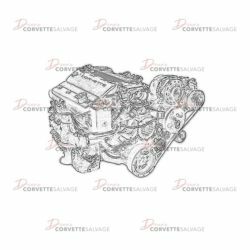 Corvette Salvage offers used, complete ZF 6 speed transmission kit assemblies which can be used to swap out any Doug Nash or automatic transmission with a ZF 6 speed transmission. This item ships truck freight. Additional shipping charges may apply after checkout. I accept the truck freight disclaimer. pål from fjellhamar recently bought this item. Do you have a 1984 to 1988 Corvette with a Doug Nash 4+3 transmission and want to replace it? 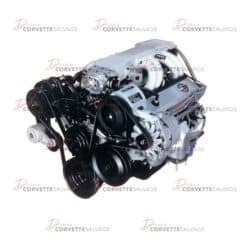 Do you have a 1984 to 1996 Corvette with an automatic transmission and want to convert it to a 6 speed standard? Corvette Salvage offers used, complete ZF 6 speed transmission kit assemblies which can be used to swap out any Doug Nash or automatic transmission with a ZF 6 speed transmission. All kits shipped out from our facility are fully tested and ready to be installed in any 1984 to 1996 Corvette. Black Tag ZF’s were made from 1989 to mid 1993. Blue Tag ZF’s were made from mid 1993 to 1996. Black Tag ZF units were made in West Germany, by ZF. By 1993, GM was making them under license in the USA. Complaints about gear whine on the Black Tag ZF led to the creation of the Blue Tags ZF units. These units were cut down on whining by cutting the gears at a steeper angle. This resulted in a marginally weaker box found on the Blue Tag ZF units. Overall, the Black Tag ZF has a 450 ft/lb rating, while the Blue Tag ZF has a 400 ft/lb rating. This part is a good, used L98 Tuned Port Injection Engine Assembly which can be installed in a 1985 to 1991 Corvette. This part is a good, used C4 LT1 Multi Port Fuel Injection Engine Assembly which can be installed in a 1992 to 1996 Corvette. 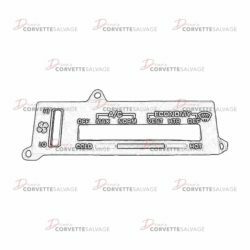 This part is a good, used C3 Air Condition and Heater Control Face Plate which can be installed in a 1977 to 1982 Corvette. 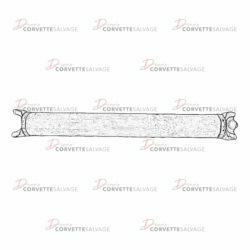 This part is a good, used C4 Automatic Transmission Drive Shaft which can be installed on a 1984 to 1996 Corvette.